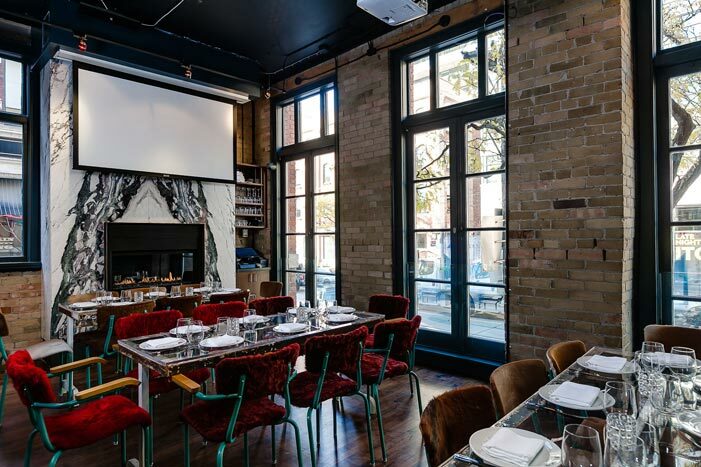 Chef Susur Lee’s much-anticipated eatery Fring’s opened in October in the 8,000-square-foot former Crush Wine Bar space on King Street West. Much of its buzz is from its association with Drake, but despite reports that the Toronto-born rapper was a part owner, he told The New York Times he just provided the name for the hot spot. The decor from Brenda Bent and Karen Gable of Bent Gable Designs offers yeti-like upholstered dining chairs, installations over the bar made from clear plastic hangers, and crosses on the walls. The space is divided into three areas: a lounge, a dining area that holds 120 for cocktails, and a private room that seats 30 or holds 40 for cocktails.